I have been getting requests for sharing my tips and tricks for baking whole wheat and millet flour breads and cakes. 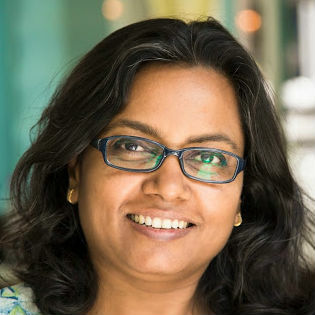 Somehow I couldn't do a detailed post on the small but significant tricks while baking with alternative flours but when KP Balakumar from Home Bakers Guild asked me to do a series about baking with alternative flours it was hard to resist. So I will be writing about baking healthy stuff for a few weeks, wait for the new post every Wednesday from now, looking forward to more queries and suggestions as we go. All of us know baking is a science and one needs to follow recipes religiously to get good results but where is the fun without experimenting with new ingredients and innovating to get a more personalised product that suits our own taste and preferences. Including alternative flours for home baking is a good idea to get more nourishment but there are more reasons why we should include various other flours other than wheat flour. All purpose flour is sacrilege for home baking. It would be useful to know why so. Traditional baking (contemporary) means only all purpose flour, butter and sugar but baking in pre industrial era was not all about white refined flour and purified industrial yeast. Whole wheat flour and sourdough starters were used to make breads and unbleached flour with or without bran was used for baking cakes. As the industrial invasion of refined flour started, the industrial corn byproducts like high fructose corn syrup (HFCS), corn starch and soybean isolates also started trickling in the industrially baked goods to provide softness, moistness, improved texture, enhanced taste and longer shelf life. In the mean time wheat was also being bred for more yield, more disease resistance and more gluten content to make the breads softer and softer. Eventually as the home baker also started depending on 'golden syrup', 'dough conditioners' and 'added gluten' along with refined wheat flour with added corn starch the industrial revolution invaded into the good old home baked products as well. Imagine you home baked cake containing innocent looking additives originating from genetically modified corn and soybeans. Incidentally, India is still not growing any genetically modified crops but 'refined corn and soy based additives' and a whole range of cake mixes are being imported and are selling like hot cakes. I am not including the chemical conditioners, preservatives and colouring agents into this discussion but just imagine how many unnatural genetically modified plant based products we are incorporating in our foods and what a chemical cocktail we serve at our tables. Please think aloud. I would like to add a word about gluten intolerance which is being brushed off as a modern diet fad, please know that we are consuming about 10 times more gluten than our previous generations as the new wheat varieties have more gluten in them and we are eating more and more wheat products both as home cooked meals and when eating out. All the other grains (coarse grains and millets) that were quite common some 50 years ago have been phased out because wheat is cheaper, wheat products are easier to produce industrially and have a longer shelf life. Coarse grains and millets get rancid faster and the overall texture of the baked product is not attractive to look at. The biggest factor in millet products not being fashionable is that industrial baking with millets is a little difficult for the manufacturer and I am telling this after some experience of training industrial bakers. There are many factors, mostly industrial, after wheat being the primary staple grain for the whole population but there is a larger concern of environment conservation as well and monoculture of wheat as a grain should be stopped, more millets should come into the food chain of modern population. Gluten sensitivity may be an individual issue, wheat monoculture is a larger concern. Imagine industrial forces guiding our food choices as we end up eating a whole lot of things our bodies are not designed for. Eating more varieties of grains ensures we do not eat loads of gluten and also provides more nourishment to the system. Gluten free for some or minimal gluten for all is not just a fad, it is the requirement in modern times. I hope everyone will be motivated towards baking breads, cakes, cookies and crackers etc using alternative flours after knowing why it is important. Baking ragi bread is as easy as baking a whole wheat bread and an English muffin with buckwheat flour is even easier. You can bake cookies using almond flour, oatmeal or even lentil flours with your choice of flavorings. You just have to put your mind to it. Before I share a few tips and tricks about baking with alternative flours, I must add that grains should not make the whole meal whether it is wheat, rice, barley, oats or any other millet. Always include loads of vegetables, some protein and good fats to your meals to make it balanced. Forget about the percentage daily allowances and enjoy real food everyday, the meals will be healthier automatically. Tip #1 Whole wheat breads are easy to bake but most people end up adding some APF (all purpose flour/maida) or some gluten to make the bread spongier and softer. There is small trick to make the existing gluten in whole wheat stronger so the bread rises well and taller. Just make a thick batter like biga with 1/4th of the total flour first and whisk it using a balloon whisk. The biga whisks easily first but within 5 minutes the biga batter starts looking stringy and resists whisking. This indicates a stronger gluten and happens due to the sticky gluten releasing from the flour particles and binding with each other. After this whisking the biga is proceeded with the remaining flour to make a dough for rising. This biga trick works like charm while making 100% whole wheat breads. This 100% whole wheat bread without added gluten can be baked in loaf tins to get sandwich slices too. But we rarely eat sandwiches and I love baking free form loaves so it is always like this. It doesn't mean I don't make some grilled sandwiches using my free form loaf slices too. This paneer sandwich is just so easy to hold with irregular shaped slices. 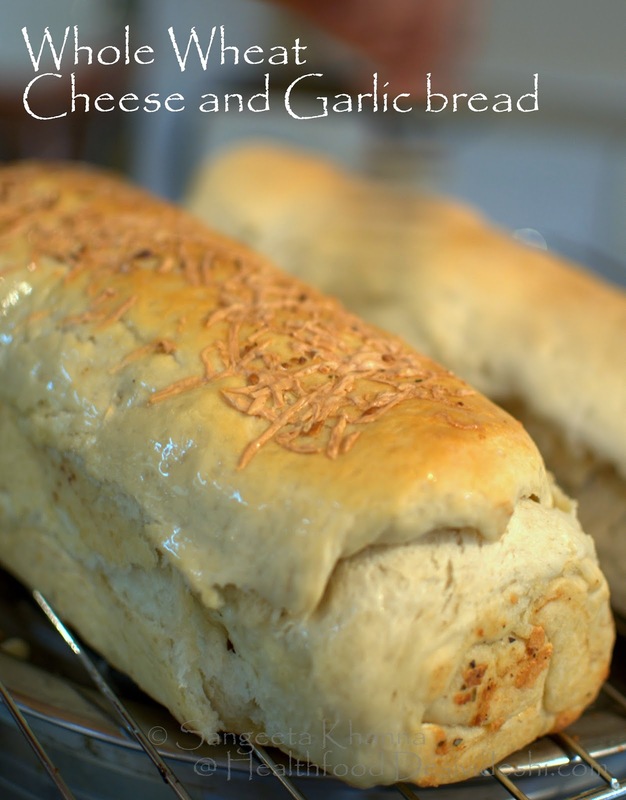 The same dough can be rolled with garlic butter and some grated cheese to make a whole wheat oats cheese bread as well. Sourdough whole wheat bread with a few more flavours is also easy to bake. 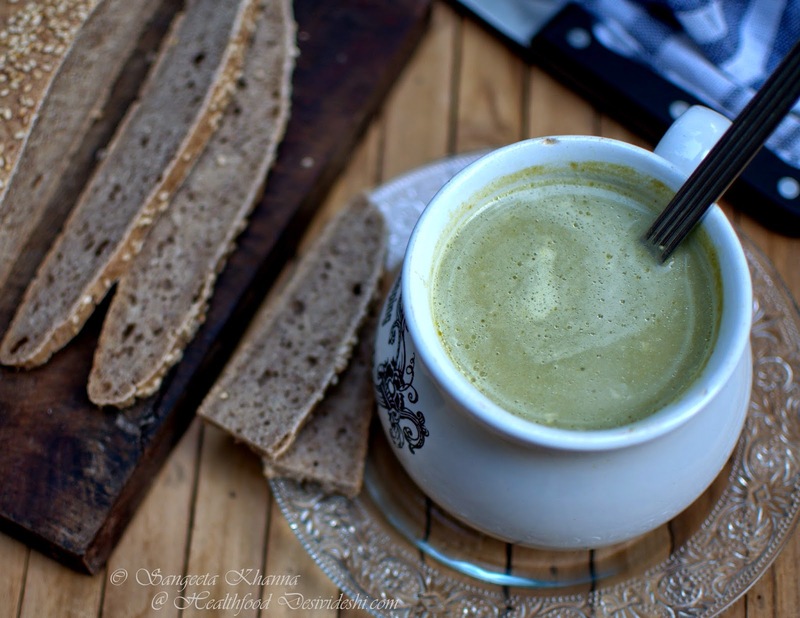 Read how to take care of sourdough starter and make a yummy bread with it. I used to bake whole wheat breads even in microwave oven till few years back and then I started baking my breads in an OTG. Next one is a sourdough ragi bread and has more complex flavour. Tip #2 Make free form loaves when the bread dough contains more than 50% millet flour and about 25% of whole wheat flour. We are talking about no APF no added gluten breads and in this ragi bread I use some potato for better binding. These kind of breads are better for bruschetta, crostini or as garlic bread sticks. Toast them and have with your soup. Ragi dough is easier to handle if you make smaller buns to make burgers etc. Check out this ragi buns recipe and how healthy the burger becomes. I find the taste more complex and 'better'. White breads are just so plain. Tip#3 Sourdough breads are healthier as many strains of yeast are involved in fermenting the dough that gets richer in diverse types of minerals and vitamins. Purified industrial yeast is good too but has limited health benefits although it does make the bread baking easier for everyone. No harm using fresh or instant varieties of yeast for bread baking. Tip#4 Whole wheat breads can be made with added oats as well and the best way to make these whole wheat and oats breads softer and moist is to use cooked oatmeal to make the dough. 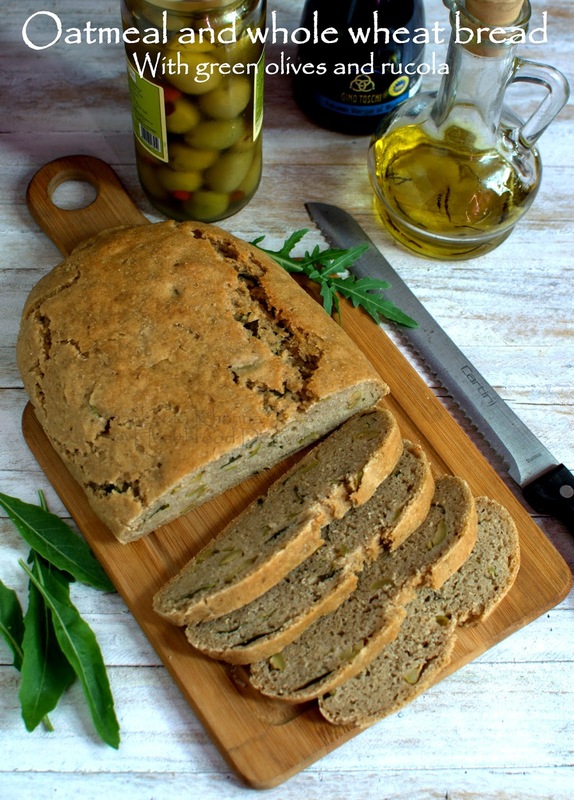 Read more details of the procedure here in this whole wheat and oats bread with rucola and olives. Tip#5 If you are not confident with a loaf while baking with whole wheat or mixed flours try and bake some pita bread or kulcha first. Flat breads are easier to handle and rise well. You can always mix flours like amaranth or barley (about 25%) in the whole wheat pita bread dough. Here is a pita bread with whole wheat and amaranth flours. Roll out softly, let them rise a bit on the baking sheet before putting the tray into the oven and bake till they fluff up. Brush with melted butter so the pita breads don;t turn hard. 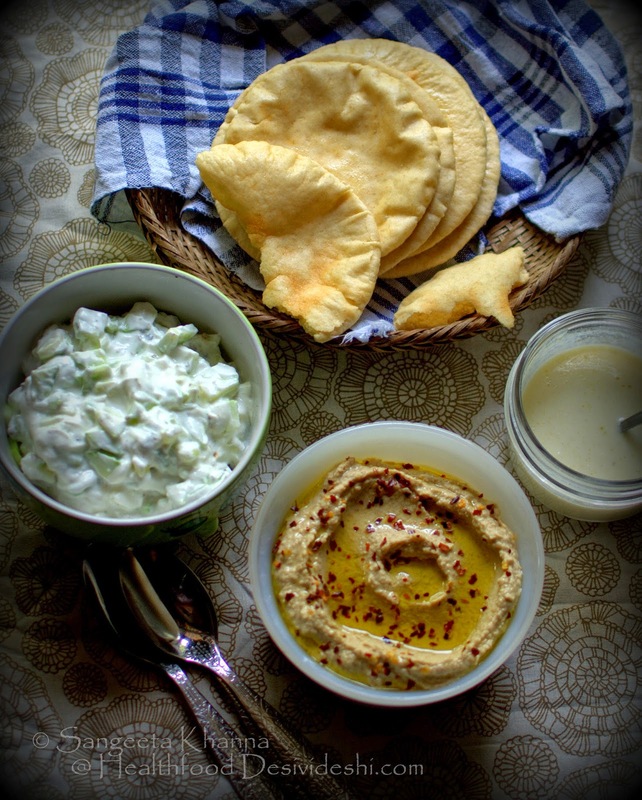 Whole wheat pita breads can become hard if left uncovered or un-buttered for some time. Tip#6 Place a bowl filled with hot boiling water in the oven so that steam circulates in the oven cavity while the whole grain breads are baking. This allows a better crust that seals the moisture within the loaf. Always brush the baked loaf with melted butter to soften the crust and seal in the moisture some more. Tip#7 Store all whole wheat and mixed flour breads wrapped in cling film after cooling them completely. Most whole grain breads last a week or so. Refrigerate till required and slice them before reheating or toasting the bread slices. A little extra care into handling the baked whole grain breads goes a long way. Remember that these breads are a little denser and you need lesser number of slices that white bread. Whole grain breads are more filling and satiating too. Richer complex taste of course. Tip#8 They say microwaving to reheat breads is sacrilege. But this rule is for the 'white' bread that looses moisture and becomes elastic when heated in microwave. Toasting works better for white breads but for whole wheat and mixed flour breads microwave reheating works like a charm. These breads are richer in texture and flavours and nothing is lost when we reheat in microwave briefly. Toasting the bread works too if you like. You can even bake some pizza with whole wheat and mixed grain dough. 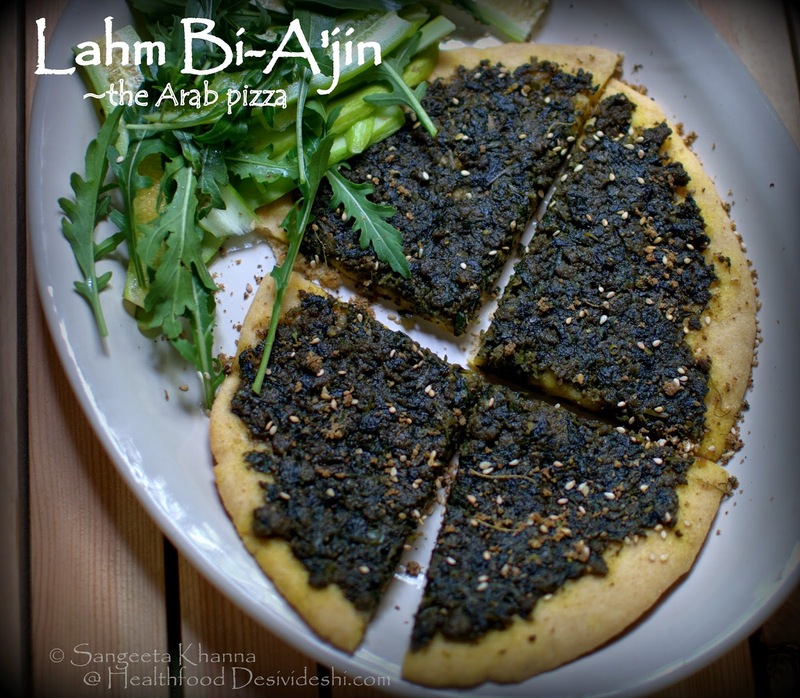 See this Arab pizza called Lahm Bi-A'jin or Sfiha that can be baked using any flour you like. A rich topping of minced meat and greens makes it a really healthy and filling meal. It doesn't mean you have to always bake a pizza. You can even bake pizza base on a griddle as well. See this buckwheat pizza I make so often. Tip#9 You can bake completely gluten free breads too if you are gluten intolerant. This buckwheat English muffin tastes yummy and can be baked on a griddle. You can always bake a focaccia with buckwheat flour using the same batter. Tip#10 Many people have asked me for recipe of a bread that can be baked without an oven. This sounds ridiculous but is very much possible. 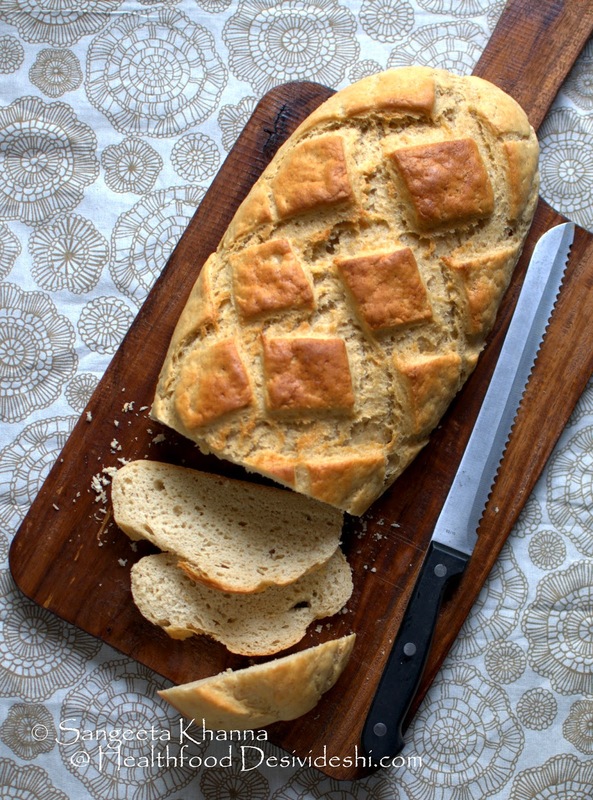 See this skillet bread recipe with whole wheat and sorghum flour. This bread can be sliced and used to make yummy crostini. Tip#11 If you are a beginner baker and afraid of the yeast monster there is nothing to loose. You can always bake some fruit based quick breads to start with. Banana bread is the simplest and often helps you use up the leftover overripe bananas. You would gradually move on to bake soda breads and then yeast breads with whole grain flours if you are determined. I have posted a version of banana bread with eggs in the past. I developed an egg less whole wheat and barley flour banana bread recipe for beginners so there is no hassle of measuring things too much. Believe me this bread turns out well even if have been adding things by just eyeballing them. 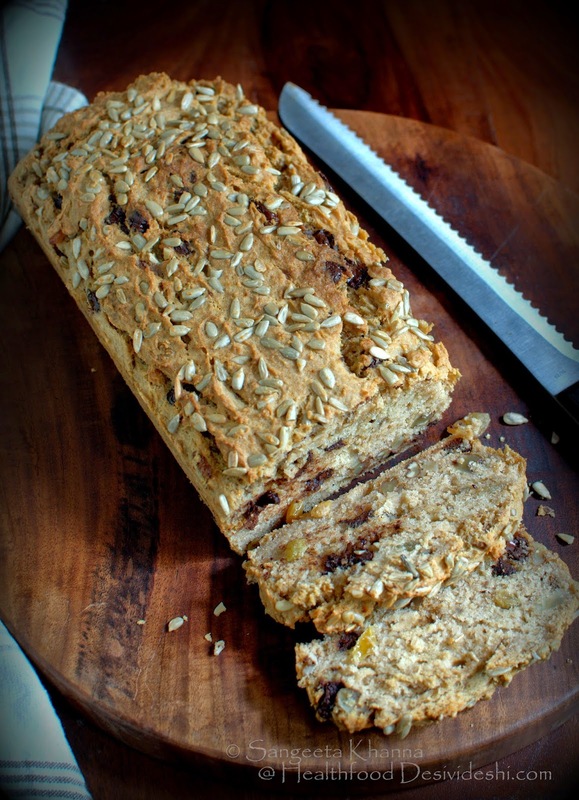 Recipe of egg less banana bread with whole wheat and barley flours.. Mix the flours with baking soda and baking powders. Add salt and sieve the flours to mix everything well. Add chopped walnuts, chocolate chips and raisin to the flour mix and keep aside. Whip a smoothie with bananas, yogurt, honey, melted butter and flax meal. Now pour the smoothie into the flour slowly and mix lightly using your hands till the mixture forms a thick batter or a very loose dough. 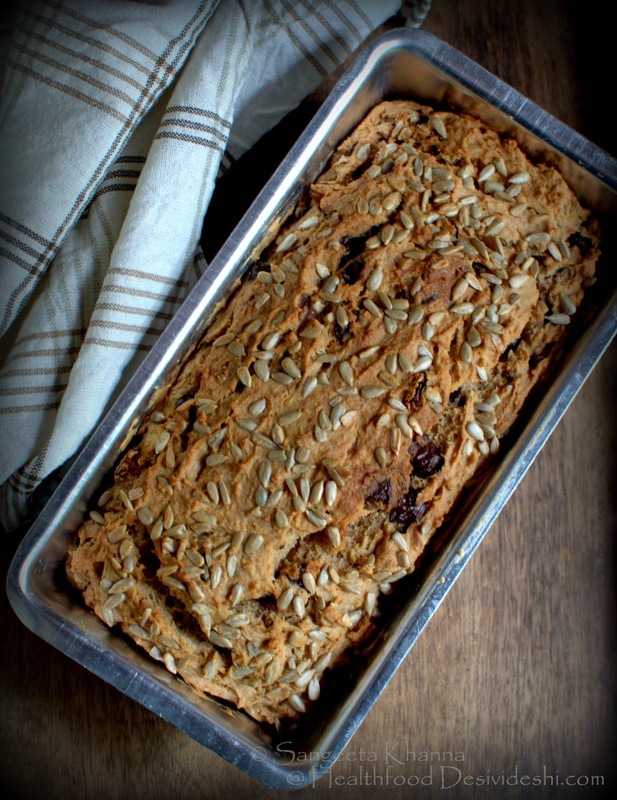 Slide this into a greased loaf pan and sprinkle all the sunflower seeds evenly over the loaf. Press the seeds with your fingers so they get embedded well. Bake for about 45 minutes or till a skewer comes out clean. Invert the loaf pan onto a wooden board and let the bread cool down before slicing. This nutty banana bread is a light textured breakfast bread and tastes really good with either fruit juice or milk. Isn't it an easy recipe? You just make a smoothie, mix the flours and nuts and mix them both to make a loose dough and bake a bread. Do let me know if this detailed post was helpful in understanding whole wheat and mixed flour (multi grain) breads. Never add gluten or dough conditioners to your home baked breads. You deserve better quality when you are putting your own elbow grease to it. Remember that bread baking is therapeutic whatever flours you use. Baking with whole wheat and millet flours makes it healthier for the family. And the last but the most important tip that I would share or rather urge you to follow is, please don't compare your home baked breads to the white sliced breads available in commercial bakeries. You deserve better than that industrial product and that is why you are thinking about home baking. 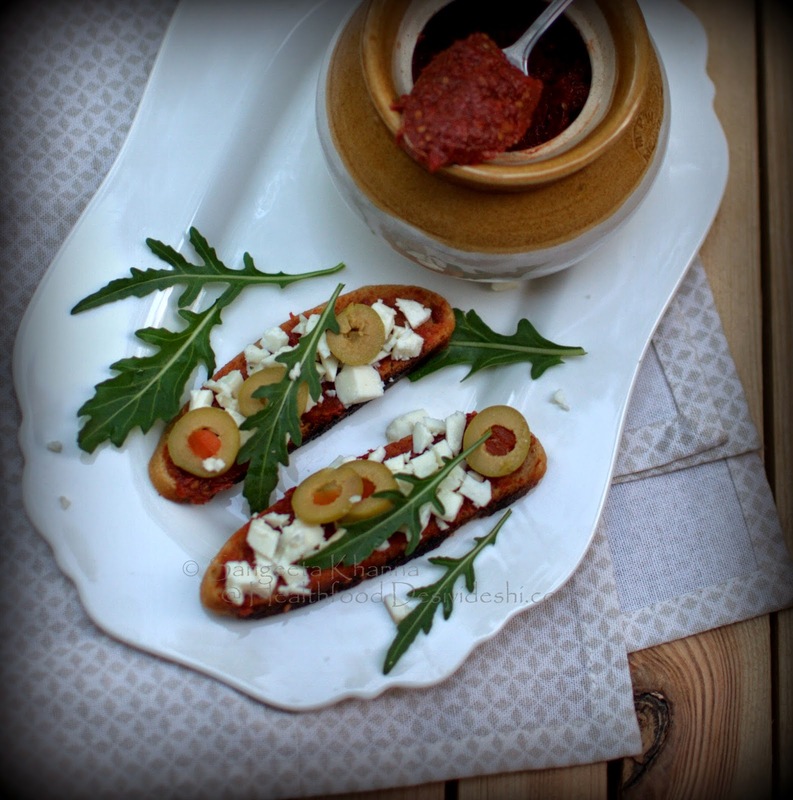 Enjoy the wholesomeness, the artisan quality and the wholesome nutrition that home baked bread brings to your table.. Thank you Sangeeta for such an informative article. Will be trying out all of these. What a remarkable article!! Just what I have been waiting for.. I love to bake breads, but often restrain myself, to avoid including too much maida in my diet.. And whenever i have baked with 100% whole wheat flour, the results have been disappointing. I usually end up eating all of it, my husband and son does not touch it. I must and will definitely try your recipes using alternative flours here. Thanks a ton! Btw, is it possible to buy ready made sour dough starter, the first time? I don't know any sources of sourdough starter but you can start your own if you wish. Search Google for tricks and tips for sourdough starter. Thanks Sangeeta for this post..it is very inspiring! I have a few questions though..........what is your opinion on packaged alternative flours in the market? Can we trust they actually contain the goodness of that millet or grain? I'm asking because its not easy to have such flours ground from scratch . Also, love the banana bread recipe...........could i replace the barley/amaranth flour with jowar/bajra/ragi flour? Packaged alternative flours from the market are good mostly. I don't see any reason to not trust he quality of good brands especially since we can't grow all the food we eat ourselves. Whenever replacing flours in a bread recipe the result will be completely different as all these alternative flours behave differently in dough form as well as while baking. You mean Biga (not bug) I am sure. The Biga has to be whisked til it becomes stringy and then added to the rest of the flour and other ingredients to go ahead with kneading right away. Manioc or other pure starches can be added in small amount but he starches do not make the dough hold up the air bubbles. Starches like manioc or potato add softness to the loaf if added in right amount. 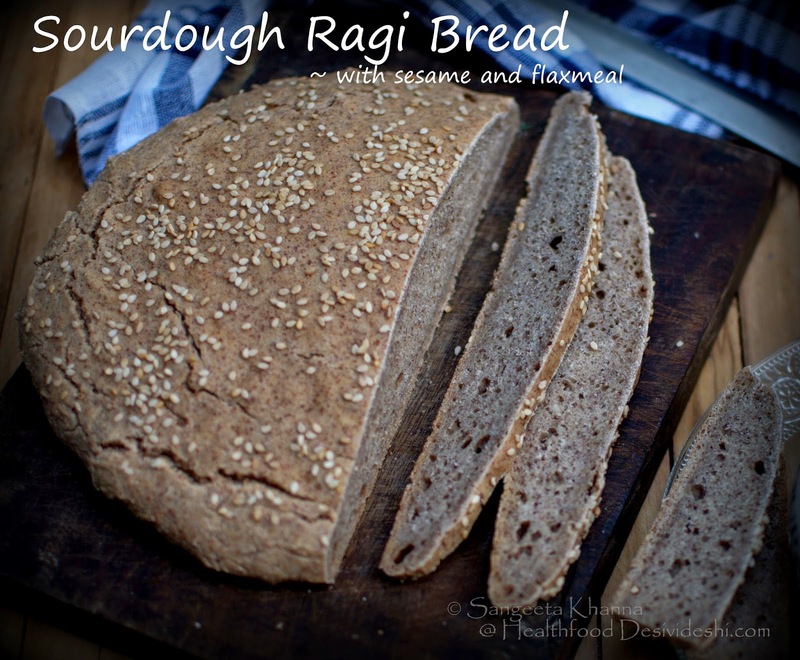 Check out the ragi bread recipe to know how I use potato starch in a bread. Sangeeta once I visited my sister's friend in Canterbury and in spite of being busy she baked a bread which involved some heavy duty kneading in two installments. When we returned after sight seeing the whole house was fragrant with the aroma of the bread in the oven. The bread had sunflower seeds and was dense giving it a rustic feel. She also presented us a loaf to take home and i loved it with currant jam and milk. Pardon my ignorance.. But what is biga? Is it just mixing little flour with the activated yeast first? Thank you so much. Which recipe did you try?